Days starting cold and sharp, apexed with golden warmth, continue here. We had a wonderful walk along the South West Coast Path on Saturday, climbing high above chalky cliffs for views of blue meeting blue for miles all around. It is another golden day today but my thoughts aren’t of outside. I have a very exciting document to look at…the text for the next Billy Hippo picture book! I can’t wait to be drawing this little chap again. 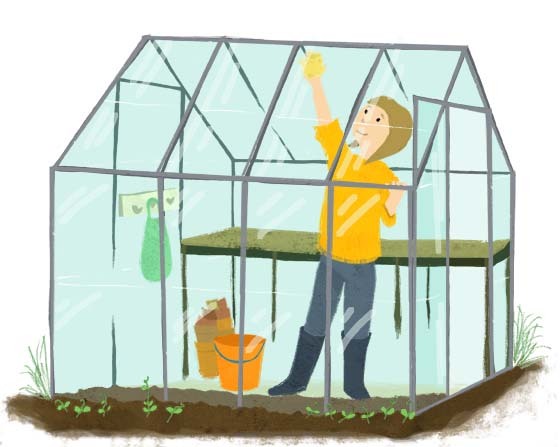 Here’s an illustration of another job I’ll be getting on with this week down at the allotment. This entry was posted in Uncategorized and tagged allotment, autumn, Billy Hippo 2, Billy Hippo. How Billy Hippo Learned to Swim, chores, field peas, gardening, golden days, greenhouse, growing, Hannah Foley, illustration, illustrator, jobs, lifestyle illustration, Little Door Books, sea, sky, South West Coast Path, views, vivian french. Bookmark the permalink. Love the drawn trasparency of that glass. Can’t quite imagine how you’ll manage drawing at the same time as cleaning glass………..